Description: The pocket trumpet is a compact size B♭ trumpet, with the same playing range as the regular trumpet. The length of the tubing, if straightened, would measure the same as that of a standard trumpet but tubing is wound more tightly than that of a standard trumpet in order to reduce its size while retaining the instrument's range. The bell is generally of smaller diameter than a standard trumpet. It is not a standardized instrument to be found in concert band or orchestra brass sections and is generally regarded as a novelty. It is used mostly by trumpet players as a practice instrument that can be packed in a suitcase and taken to places where carrying standard trumpets would be an issue. Although not having a reputation as a serious concert band or orchestra instrument, it has occasionally been used by soloists in jazz or other ensembles to add flair and variety. 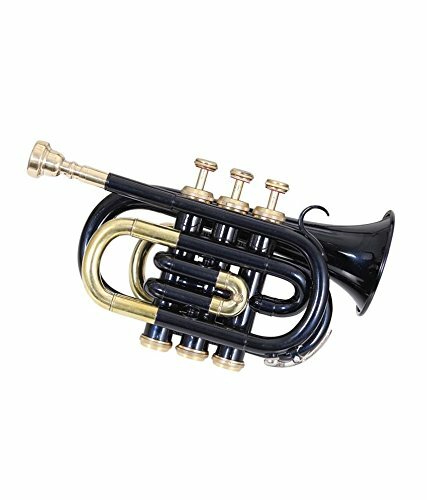 Product Description : Beautifully designed and in perfect finish pocket Trumpet is available for sale , all the keys are working in perfect condition ,checked by professionals. This stylish pocket Trumpet can be used by both professionals and beginners. Is available for sale at a great discount We manage best quality in low prices. If you have any questions about this product by SAI MUSICAL, contact us by completing and submitting the form below. If you are looking for a specif part number, please include it with your message.